Care+ is a comprehensive notetaking and task management app, designed to improve the information delivery and communication system of healthcare today. The goal of the project was to design an app for the assigned topic. My assigned topic for the project was note-taking and I chose healthcare as my target audience. I started with some secondary research to get a better understanding of the problem. I looked into online articles, research papers, videos and other documents to identify this problem. Nurses recognize that paperwork is an integral part of delivering care and an important method of communication and that some of the paperwork they complete is patient-focused and essential. They also have a professional duty to provide information for quality improvement and managing services effectively. However, the current amount of paperwork they are expected to complete can result in nurses being unable to effectively prioritize and focus their energies on documents of real value and, most importantly, it reduces the time they have for patient care. How might we design a system that would help improve the communication system in healthcare, and allow nurses to deliver a better professional nursing practice? How might we also integrate paperwork into our system, so that we can avoid data duplication? Care+ is a closed-loop communication system between the hospital and its staff. The app allows the management system to assign real-time tasks to their nursing staff as their shift begins. Helping nurses to focus on the task at hand and always be where they’re needed the most. 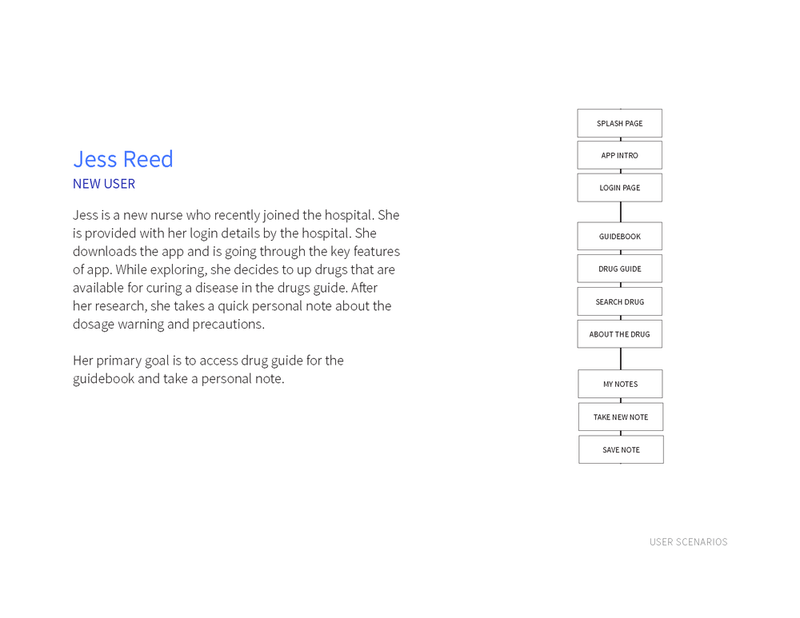 The app would allow the nurses to take notes and access previous records enabling improved patient care and safety. In addition to note-taking, an integrated medical guide would help nurses to prepare for point-of-care situations. My assigned topic for this project was note-taking. 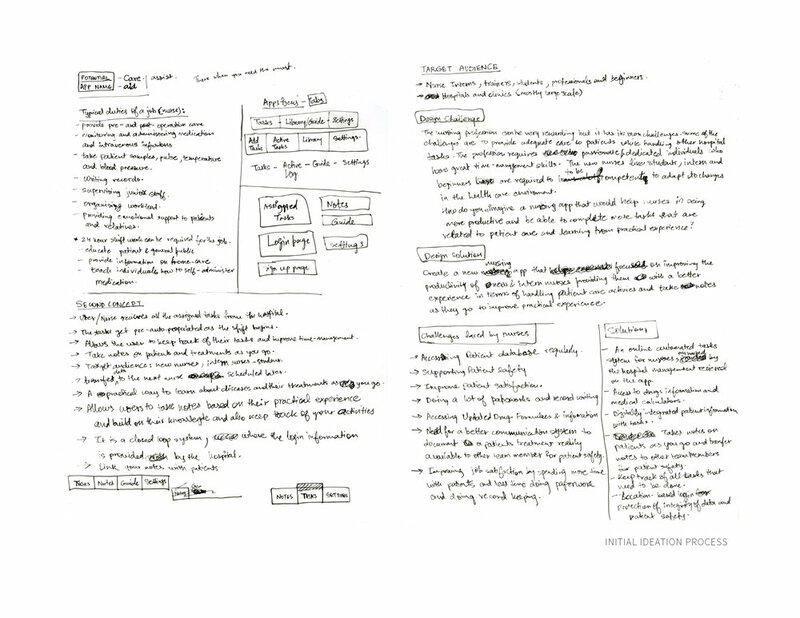 I started with market analysis, looking a what other note-taking apps are out there. I wanted to focus on something different so I decided to pick a specific target audience, understand their problem, needs and opportunities. I created two user scenarios to help understand how the users would navigate across the app to achieve their goals. I then planning out the structure of the app and where the different features of the app would exist. This project was initially completed in Dec 2016, but I redesigned the app UI in Nov 2017. Here are some of the screens from initially design process and first version of the app. With my redesign, I decided to go with a simple colour palette and lots of icons to make it easier to navigate. The reason why I picked blue is that it produces a calming effect and is associated with health, healing, tranquillity, understanding, and softness. I picked green because it is associated with emotional healing and protection. 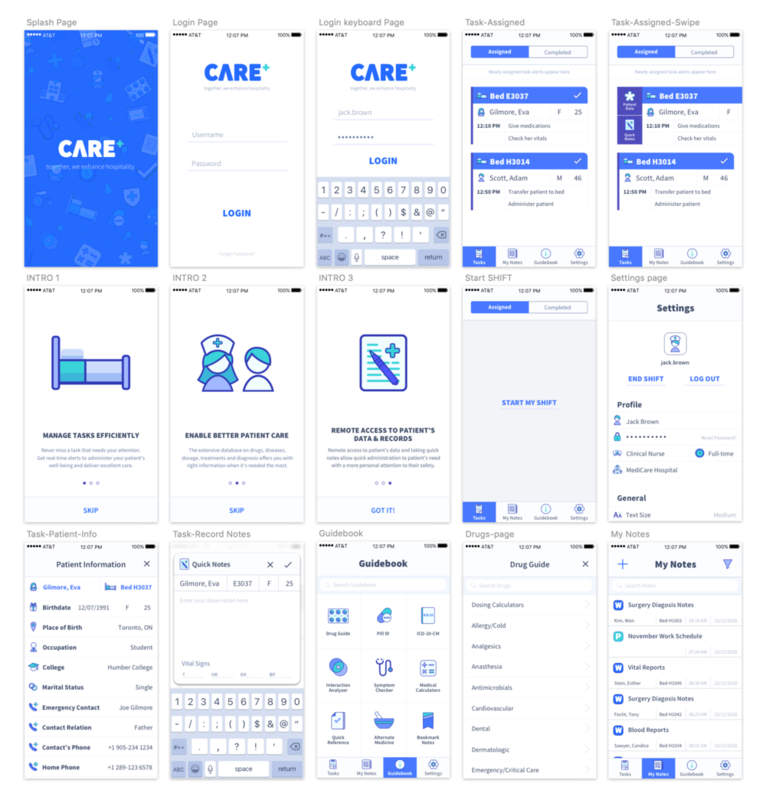 CARE+ is a comprehensive note taking and task management app, designed to improve the information delivery and communication system of healthcare today. The app allows management to assign real-time tasks, so nurses to focus on their task at hand and always be where they’re needed the most. Nurses can take notes and have access to previous records of their patients, enabling improved patient care and safety. In addition to note-taking, an integrated medical guide would help prepare nurses for point-of-care situations. This new system eliminates duplication and enables nurses to focus on their primary duty to ensure safe, competent and ethical nursing care. The onboarding screens are designed to give user a tour of the main app features. Never miss a task that needs your attention. Get real-time alerts to administer your patient’s well-being and deliver excellent care. Prevent any further misinterpretation of patient information and avoid harm. Have access to your patient’s basic personal information on-the-go to keep track of their diagnosis, treatment response and medication. Quick notes allow nurses to keep a consistent record on a patient’s well-being. The data helps the doctor with diagnosis and oncoming nurses to deliver quality care with safety. Store all your work and personal notes in one place. Digital record-keeping allows a centralized storage system for all patient records, avoiding duplication and making it more accessible when needed. Personal notes allow nurses to take notes about their other work-related things such as their work schedule and educational guidebook notes. The essential medical guidebook provides nurses with quick access to important and relevant medical information such as drug guide, symptom checker, pill ID, medical calculators, interaction analyzer and much more, so they can advocate and intervene, if needed, to ensure patient safety. Get access to general settings such as reminders, text size, and night mode for greater accessibility. Protect your data by adding an extra layer of security by enabling a passcode to access tasks and work notes. Here's a live prototype of my Version 1 (Dec 2016) and Version 2 (Nov 2017) of Care+ App. Care+ was the first app I have ever worked. It was during this project I first found my passion for UI/UX and human-centred design. The project isn’t backed up by a lot of research or any user testing but it definitely helped me understand the very basics of what it took to build a successful product. After my first product design internship at Universe in 2017, I decided to revisit the project in 2018, as I could now identify some UI/UX issues and I wanted to apply what I learned at my internship to this project. I decided to completely redo the user interface so that it uses the native iOS patterns, consistent iconography, simpler colours and add spot illustrations, empty states and animation for delight. Reflecting on the project today, there is a lot of things I would do differently. If I did this project again, I would start with stakeholder interviews to identify the real problems, instead of making assumptions from secondary research. I would love to also do user testing and keeping the target audience and engineers, in a loop with the design process so I can make an informed design decision and work with real constraints. As a second-year project, I had no idea of feasibility and constraints, and so I tried to accommodate every single feature idea I had for this app. Now that I look at it, the app looks really cluttered and losses the ‘easy-to-use’ aspect. I would definitely cut down on some features and prioritize the important ones based on the core user needs.